Somali security forces have detained two male suspects from different cities of Kismaio and Mogadishu for wearing Muslim women’s dress. The suspects have not been named and they are under investigation by the police, with no other evidence yet at this point to confirm the men were potentially linked to terrorist militants. 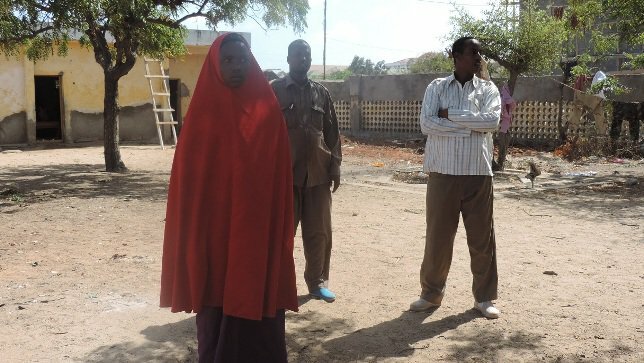 When captured, the two men were not carrying weapons or any devices but are only suspected to be an operational cell for the facilitation of some activities by Alshabab. They dressed in full-body veils worn by some Muslim women to make sure none of their skin was exposed. Male terrorists dressing up as Burqa-clad women in order to carry out attacks have become a concern in many countries such as Afganistan, Pakistan, Iraq, Yemen and Somalia. Some suicide bombers at times disguise themselves with the Burqa which covers the body from head to toe, with a mesh for the eyes. The Burqa is a piece of clothing that covers a woman from head to foot; there is only a small opening for the eyes but the rest of the body is covered. While used for modesty within Islam, there is disagreement about whether the Burqa is compulsory. In Somalia, a majority of women wear the Hijab with a traditional cloth wrapper that goes past their knees. Many Muslim women wear the Hijab because because they say it is a means of fulfilling the religious commandment and modesty. The word hijab comes from the Arabic for veil and is used to describe the headscarves; these scarves come in a myriad of styles and colors as well. The type most commonly worn in Somalia is a square scarf that covers the head and neck but leaves the face clear. Women who wear transparent or tight clothes are known as ‘Ariyat’ meaning the uncovered and this is seen as inappropriate dress which muslims say offends public decency and modesty while there are cultural dresses worn in some parts of the country without the scarves.